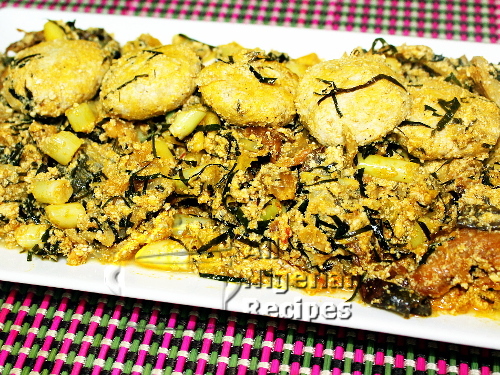 Ofe Achara with Akpuruakpu Egusi (Mgbam) is the most traditional way to prepare Egusi Soup. The akpuruakpu is molded egusi. 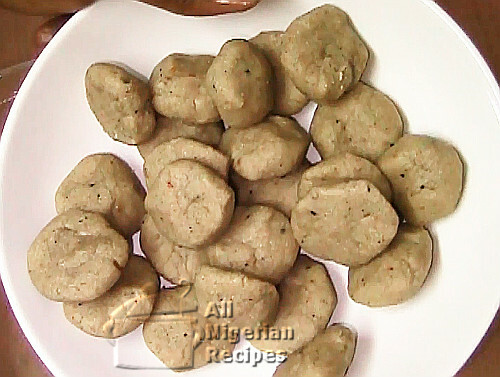 This is not just ordinary molded egusi that scatters as you cook the soup. These disc shaped molds of egusi should be intact and solid by the time the soup is done such that the person enjoying the soup can bite into and chew them like meat. Since most of the ingredients listed above come in different sizes, it is advisable to watch the video below to see the sizes of the ingredients I used. I used only stockfish and dry fish in preparing this soup, no meat. But you can add meat if you want. Achara is elephant grass (Pennisetum purpureum). The word achara is Igbo language and this one word means elephant grass, bamboo and sugar cane (also okpete in Igbo) but as far as this recipe is concerned, achara is elephant grass. I asked on Facebook for other names for achara in other languages and I got: Achala (a variant spelling in Igbo), Ireke / Ireke Obo (Yoruba), Takanda/Kara (Hausa), Kangale saudu (Kanuri), Asara (Ibibio), Mbritem (Akwa Ibom). I have asked for confirmations from the contributors to make sure some of these names do not translate to sugar cane because the achara used in Ofe Achara is not sugar cane. I will update these names as I get more feedback. Achara is NOT: sugar cane, lemon grass nor spring/wild onions. Ogiri okpei is made with locust beans. It is known as iru in Yoruba. It adds a traditional taste to Nigerian soups that it goes well with such as Egusi Soup and Ogbono Soup. If you do not have it, use only crayfish. Some people add achi or ófó (both are Egusi Soup thickeners) to this soup. You can achieve a similar effect using ósú. See video below. Ósú is a binder for the molded egusi. It helps hold the balls together so that no matter how you stir the soup, the egusi balls will not disintegrate. Ósú is a naturally occuring parasitic plant that grows on trees. I do not know any other names for it. 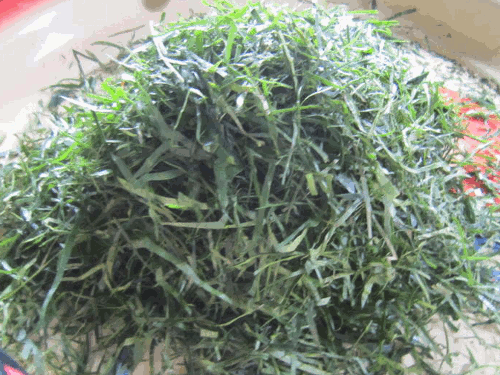 Okazi is afang leaf (Gnetum africanum). Soak the stockfish and dry fish with cool or lukewarm water to soften. When soft, clean thoroughly and debone. Grind the egusi seeds and the ósú with a dry mill. Grind the crayfish with the ogiri okpei, also with a dry mill or spice grinder. Peel the achara by removing the coarse outer husk till you get to the tender part. Then break the tender part into 1 cm long pieces. Any part of the shoot that is not brittle (easily breakable), should be discarded. Rinse the pieces of achara and set aside. Pound the habanero pepper with a mortar or grind with a hand blender. Cook the stockfish with the stock cubes (seasoning cubes) till soft and pour some of the stock into a bowl. Yes, this has been soaked earlier but stockfish is quite tough and soaking alone does not get it as soft as we need it. The soaking is necessary so that it can be cleaned very well. Pour most of the ground egusi (about 70%) into a clean dry bowl. Season the egusi with dry pepper and some of the crayfish and ogiri okpei blend. It's important to season the egusi very well so that the mgbam will not taste bland when one bites into it. Add some of the fish stock to the egusi and mix till a thick dough is formed. 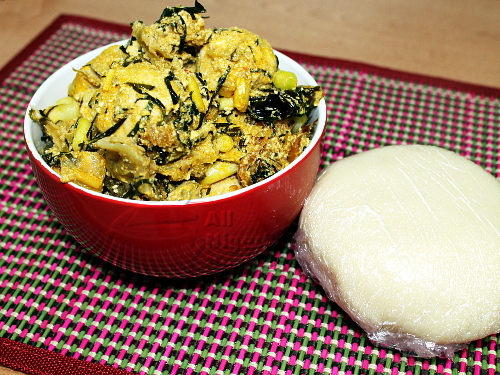 Mold the egusi dough into flat discs, as big as a coin and set aside. Boil some water and throw the molded egusi into the pot of boiling water. Cook for 10 minutes on medium heat. Set the pot of stockfish on the stove. It should still contain some stock from cooking the stockfish. If not, add the water from boiling the egusi balls. Add the deboned dry fish, habanero pepper and the remaining crayfish and ogiri okpei blend and bring to a boil. Once it boils, take off the fish and set aside. Add the remaining ground egusi to the stock, stir and cook till you see some clear egusi oil come to the surface. This should take 15 to 20 minutes. Stir the soup often so it does not burn. Add the water you used in boiling the molded egusi when necessary. Once you are sure you see some clear oil at the top, add palm oil and cook for 5 minutes. Add the boiled akpuruakpu egusi, achara, okazi and the fish we took out earlier. Add salt to your taste, cover and once it boils again, it is done! Serve with any Nigerian fufu meal especially Akpu (Cassava Fufu). 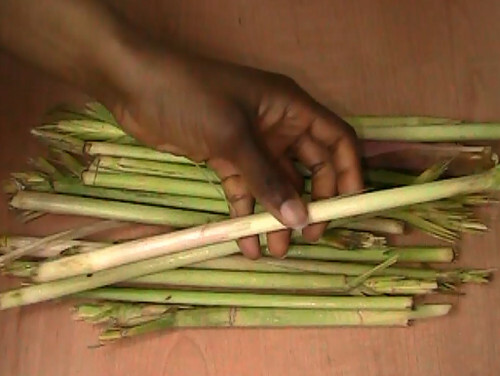 If you have any questions about preparing Ofe Achara, click here to ask me.